How gorgeous is the Italian edition of THE LOOK OF LOVE? I'm thrilled that this story will soon be published all over the world. Give THE LOOK OF LOVE as a gift to a friend, family member or someone else in your life (think: stylist, favorite teacher, barista, dog walker! ), and I'll mail you a personalized, signed book plate that you can attach to the inside cover. DadQuarters make amazing gifts--even better, with a personalized note from the author! Details above! Happy Birthday to The Look of Love! The New York Daily News Loves THE LOOK OF LOVE! So grateful for this lovely review from The New York Daily News! THE LOOK OF LOVE is in US bookstores everywhere on November 25! Three More Books in the U.S., and a New Publisher: Random House! With much gratitude and love for all the friends, family, colleagues and mentors who helped me arrive at this place in my career, I am turning the page to a new chapter (and toasting with some sparkling cider with my 3-year-old!). After seven novels with Penguin Books (and nothing but fondness and appreciation to my beloved editor and friends at Penguin), I am so thrilled to announce that I have accepted a 3-book deal in the US with Ballantine Books at Random House, which will be my new publishing home alongside authors such as Jodi Picoult, Emily Giffin, Anna Quindlen, Debbie Macomber, Lisa See, Curtis Sittenfeld and so many others. While the landscape of my life has changed in many ways this year, in my heart, much remains the same. I'm still the little girl who loves to write stories and share them. Nothing in life is certain; and it is no secret that this year has been very hard for me in my personal life. But I get up every day excited about three things: my boys, my coffee, and my career. I have a lot to be grateful for, and so much to celebrate right now. 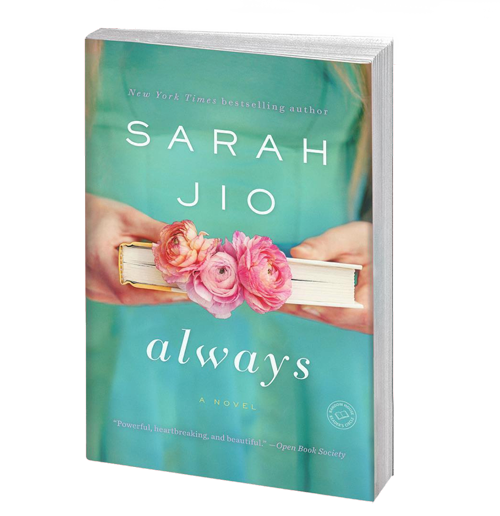 Here's the announcement that ran in Publisher's Marketplace: "New York Times bestselling author Sarah Jio's next three novels moving to Jennifer Hershey at Ballantine by Elisabeth Weed at Weed Literary (NA). Three More Books Coming to Turkey! I'm so excited to announce that I have just accepted a three-book deal in Turkey with a new publisher: Pena Books. They will be publishing my eighth, ninth, and tenth books, and I couldn't be more pleased to be welcomed so generously and warmly into their publishing family, where they have a fantastic list of bestselling authors, including Mitch Albom and James Frey. The above is the official announcement that went out in Turkey (wish I could read it! ), and here is the announcement that ran in Publisher's Marketplace last week: "New York Times bestselling author with multiple bestselling novels in Turkey as well, Sarah Jio's THE LOOK OF LOVE and two other untitled novels, moving to Pena, in a good deal, by Jenny Meyer on behalf of Elisabeth Weed at Weed Literary." This week in New York City, a publisher asked me who my literary idols are. I rattled off a bunch of names, but at the top of the list was the one and only Nora Ephron. She's done about everything in the writing world from penning epic memoirs and novels to writing articles and screenplays (Sleepless in Seattle will always be my favorite). I think about Nora a lot, especially lately. I often think, 'what would Nora do?' And the solutions is almost always equal parts brave, bold and hilarious. My pal Joanna Goddard recently unearthed this quote from Nora that I loved: “We have a game we play when we’re waiting for tables in restaurants, where you have to write the five things that describe yourself on a piece of paper. When I was [in my twenties], I would have put: ambitious, Wellesley graduate, daughter, Democrat, single. Ten years later not one of those five things turned up on my list. I was: journalist, feminist, New Yorker, divorced, funny. Today not one of those five things turns up in my list: writer, director, mother, sister, happy.” How would you describe yourself in five words? Right now, I might say: mother, friend, writer, runner, hopeful. I also love, love, love Nora's words on shaking things up: "Whatever you choose, however many roads you travel, I hope that you choose not to be a lady. I hope you will find some way to break the rules and make a little trouble out there. And I also hope that you will choose to make some of that trouble on behalf of women." Yes. Oh, and one of the coolest career moments for me (aside from interviewing Maya Angelou), was when I sent Nora a copy of my first novel when it was first published, and her assistant, very kindly, wrote me to say that Nora had the book on her bedside table and was enjoying it. Whether that was true, or merely meant to make a fledgling author feel happy, I'll never know. But, I'll tell you: I smile every time I think about a novel of mine on Nora's bedside table. The world misses her.